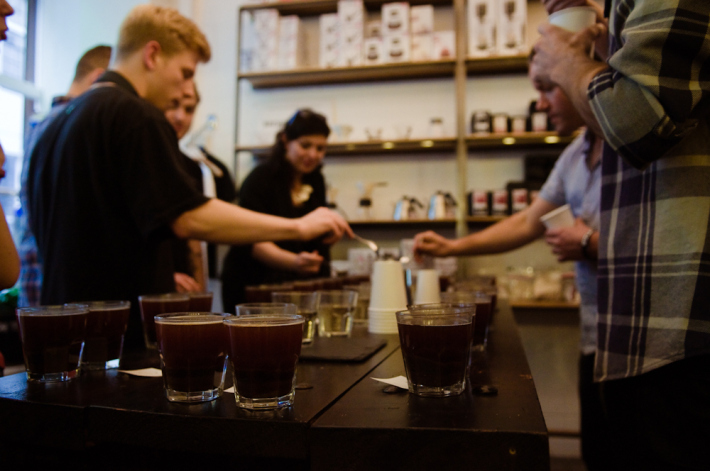 Thank you to The Association and Prufrock Coffee for being such excellent hosts for our recent cupping events! To recap: Our focus during the Association cupping were the Hacienda La Esmeralda Special auction lots. The Peterson family produces separate lots based on geographic areas, microclimates and picking dates from their farms and then auction these lots each year. The date for this year's auction is May 21st and we wanted to give UK roasters the opportunity to taste and form a buying group to bid on these amazing coffees during auction. Our cupping at Prufrock had a broader focus and in addition to cupping the Esmeralda lots, cuppers tasted fresh crop Guatemalan and Honduran coffees coming from our friends at Bella Vista in Antigua and San Vincente in Santa Barbara. Also in the mix were soon-to-arrive Kenya and Ethiopia coffees. There were great turnouts at these events! Thanks to all who took the time to join us. For all you out there who couldn't join us in London, don't despair! We're make the rounds again in May and June. Mark your calendars! Oslo: May 15 @ Kaffa Roastery. Esmeralda auction lots, Guatemala, Honduras, Kenya and Ethiopia. Berlin: May 21 @ the Barn. Esmeralda auction lots. Auction is that day! May 28 @ the Barn: Guatemala, Honduras, Kenya and Ethiopia. Nice: June 26-28 during SCAE World of Coffee. Details to follow!